Sampa Bhadra (Physics & Astronomy), member of the Tokai to Kamioka (T2K) team that shared the Breakthrough Prize in Fundamental Physics. PhD candidate George Conidis (working with Marshall McCall – Physics & Astronomy) on the Mitacs Award for Outstanding Innovation, which he received at a ceremony in Ottawa. Tom Salisbury (Mathematics & Statistics), recipient of the Canadian Mathematical Society’s Graham Wright Award for Distinguished Service in recognition of his sustained and significant contributions to the mathematics community and to the Society.The Faculty of Science recognized top students and faculty members, including recipients of the Excellence in Teaching and Excellence in Research awards, at our annual Honours and Awards evening. At this year’s event, more than 400 students, guests and faculty members were treated to keynote speaker, York Science alumnus Dan Riskin (MSc ’00). 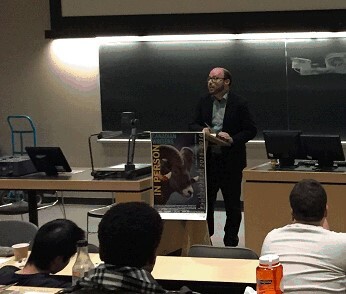 Science and Technology Studies hosted Giller-prize winning author Sean Michaels for an event that blended science, music and literature. Michaels read from his book Us Conductors, his story about the invention of the theremin, and Hillary Thomson played the musical instrument. About 200 people attended. Our thanks to Jamie Elwick (STS) for organizing. 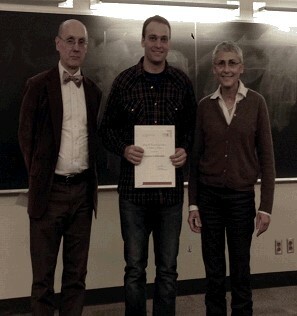 Mathematics and Statistics held a combined 50th anniversary celebration and the annual departmental awards ceremony. Peter Gibson and Youness Lamzouri spoke about mathematics in The Simpsons animated TV series. Edward Jones-Imhotep (STS) and Katey Anderson organized the annual conference of the Canadian Science & Technology Historical Association, where several York colleagues including STS Chair Ernie Hamm delivered papers. Jane Heffernan (Math & Stats) organized a Café Mathématique at the Fields Institute, where she moderated a discussion on “The Flu, West Nile Virus and Ebola: What Mathematics Can Tell You,“ with Jianhong Wu serving as one of the panellists. The room was filled to capacity with high school students to retirees, hearing about the application of math to unexpected areas of discovery. The Biology@50 Day featured a career panel, Ron Pearlman and Brian Colman speaking about the department’s history, and a keynote address about producing biofuels from cyanobacteria by alumnus John Coleman (PhD ’81). Congratulations to Kira Neller (Hudak Lab), Akhi Akhter (Rosonina Lab) and Miranda Chen (Sharma Lab), who tied for first place in the poster competition. 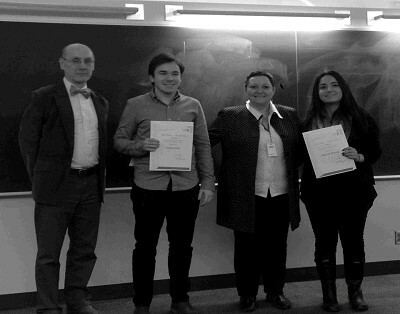 Our thanks to Vivian Saridakis, Jean-Paul Paluzzi, Emanuel Rosonina, Jyotsna Viyanak and Dayana D’Amora for organizing the event. Amro Zayed (Biology) received widespread media coverage, following the announcement of $7.3 million in funding for a genomics project led by him and Leonard Foster (UBC). Zayed was interviewed by CBC‘s The Current, CTV News, Toronto Star, Radio Canada International, CBC News, Metro News, and many others. Several media outlets featured PhD student George Conidis (working with Marshall McCall – Physics & Astronomy), including Toronto Star, Global News, Radio Canada International. Jianhong Wu (Mathematics & Statistics) was featured in the Toronto Star‘s article on How Canada reversed the brain drain. Dean Ray Jayawardhana commented about the Breakthrough Prize in Fundamental Physics for the Globe & Mail and about the Nobel Prize in Physics for Maclean’s. Paul Delaney (Physics & Astronomy) spoke to CTV News about the newly discovered planet ‘just around the corner’ from Earth. Dawn Bazely (Biology) explained to The Tyee how a warming climate is driving changes to urban ecosystems. The MacLean’s University Rankings publication listed two “cool courses” for York University, including our very own NATS 1945 – Physics for World Leaders, taught by Robin Metcalfe (Science & Technology Studies). 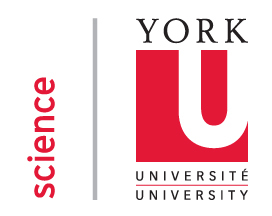 Dec 11 – York Science Forum with Lisa Randall at the Appel Salon downtown, also featuring Sean Tulin and Wendy Taylor (both in Physics & Astronomy). Tickets are free, but seating is limited and registration is required at http://yorkscienceforum.eventbrite.ca.